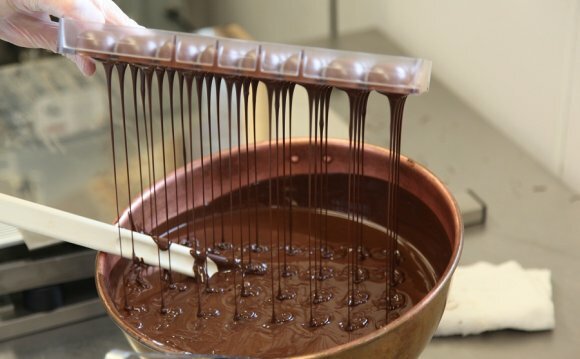 Continuous flow, top and bottom enrober designed for use with outboard chocolate tempering systems suitable for full, half or bottom-coating of pralines, bars, pastries, etc with belt speeds rated from 12-36 ft @ min, number and pounds of product @ min is dependent on type application being run. Equipped with a 84" L x 72" W stainless steel mesh conveyor and the band width of has no restrictions on rate at which chocolate is used due to external tempering blower operating within a tolerance of only +/-1% over entire width of the machine. Additionally features: Air knife, 6 – 2-1/2" diameter tri-clover product dispensers, 72" W x 2" L heat lamps and infeed / discharge height of 44". Adjustments for chocolate temp, jacket temp, band speed, bottom bath depth, band tension, shaker speed, with all stainless steel contact parts.